Officials plan to enter a closed Standing Rock camp site near the Dakota Access Pipeline early Thursday following the arrest of 10 people after a deadline to leave the area expired. North Dakota Gov. Doug Burgum said the remaining 25 to 50 or protesters holding out in the Oceti Sakowin camp site will be allowed to leave without being arrested so contractors can continue cleaning up the protest site near the controversial 1,172-mile long pipeline. Those who refuse to leave will be arrested. "You know that our big ask for tomorrow is anyone remaining in the camp, we want to make sure that they know they have an opportunity to voluntarily leave," Burgum said. "Take your belongings, remove anything that may be culturally significant and we'll help you get on your way if you need to do that." The 10 people who were arrested on the highway Wednesday outside the camp near Cannon Ball, North Dakota, had refused commands to leave the area, officials said. Authorities then closed the camp and did not allow vehicles to enter. The arrests came at the end of a day without any major conflict after police did not enter the camp. About 100 protesters voluntarily left before the 2 p.m. state deadline set by Burgum. Protesters chanted, waved flags and played drums as they left. At one point on Wednesday, a handful of tents were set ablaze. Tribal member Kaooplus Enimkla Thunder and Lightning said some of the tents were frozen into the ground and had to be burned to be removed. Other tribal members said the fires are part of a tribal tradition. Burgum said a 17-year-old girl suffered severe burns and a 7-year-old boy was injured from either an explosion or an out of control blaze in the camp. "Anybody that's there is trespassing, so anybody that's there is breaking the law," he said. "Anyone who obstructs our ability to do cleanup will be subject to arrest." North Dakota Highway Patrol spokesman Lt. Tom Iverson said authorities had given a group of protesters who agreed to be arrested an additional two hours to leave on Wednesday but that group never materialized. He said law enforcement were then confronted by "agitators" who approached the law enforcement line "provoking them." Iverson said authorities were patient and gave people multiple warnings to back up and leave the roadway outside the camp entrance. Some people backed off, he said. "We knew this day was going to come," Iverson said, referring to the state deadline to close the camp for environmental and safety reasons. Last week, Burgum signed the emergency evacuation order of the property to allow private contractors to remove waste from the Oceti Sakowin camp area, which officials say is in a flood plain. The order said warm temperatures have accelerated snowmelt and increased the risk of flooding, and that those in the flood plain are at risk of personal danger. Burgum's order came as the project moved closer to completion after the US Army Corps of Engineers recently granted an easement for the last stretch of the pipeline bitterly opposed by Native Americans and environmentalists. Oceti Sakowin was the main camp closest to where the pipeline will go underneath the Missouri River. At the peak of protests, the camp's population climbed to as many as 10,000 people. North Dakota officials had strongly encouraged the remaining protesters to leave the camp. North Dakota officials, including the North Dakota Department of Health, offered to bus protesters to a travel assistance center, where they would be able to receive water and snacks, health assessments, a hotel lodging for a night and bus fare home. The Standing Rock Sioux tribe has also repeatedly asked protesters to leave for safety and environmental reasons. The tribe, which sued the US Army Corps of Engineers last July, has said the fight over the pipeline belongs in the court system. Native Americans march in 2016 to a burial ground site they say was disturbed by pipeline bulldozers. The $3.7 billion pipeline is slated to stretch through four states -- from North Dakota into South Dakota, winding through Iowa and ending in southern Illinois. It is expected to move 470,000 barrels of crude oil a day across the Midwest. The project is completed except for the contested portion under North Dakota's Lake Oahe, half a mile upstream from the Standing Rock Sioux tribe's reservation. Tribe members are concerned the pipeline would affect their drinking water supply and place downstream communities at risk of contamination from potential oil spills. The pipeline moved forward last month after President Donald Trump signed executive actions advancing its approval. Trump's actions cast aside efforts by former President Barack Obama to block the pipeline's construction. The order directed "the acting secretary of the Army to expeditiously review requests for approvals to construct and operate the Dakota Access Pipeline in compliance with the law." Soon after, the US Army Corps granted a final easement. The move was enthusiastically greeted two weeks ago by Energy Transfer Partners, the pipeline's developer. The company has said it's ready to proceed. 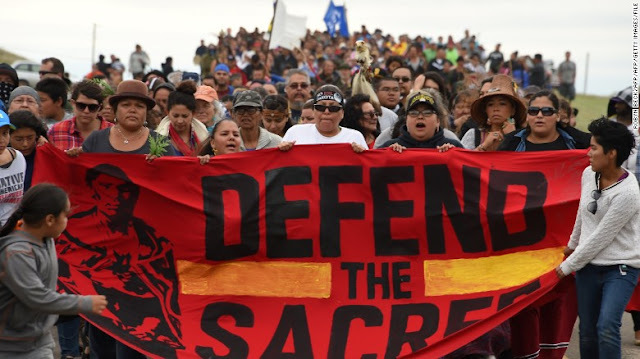 But the Standing Rock Sioux Tribe and its allies claimed then that the easement shouldn't have been granted without the issuance of an expected environmental impact statement. Last week, Earthjustice, a nonprofit environmental law organization, filed a motion on behalf of the Standing Rock Sioux Tribe questioning the legality of the Trump administration's decision to issue the permit, according to Jan Hasselman, Earthjustice's lead attorney for the Standing Rock Sioux Tribe. US Army Corps' actions violate the tribe's treaty rights. The tribe has demanded a proper environmental impact statement to identify risks to its treaty rights, including its water supply and sacred places. Hasselman had said Obama administration found that "the Tribe's treaty rights needed to be acknowledged and protected," and other locations for the pipeline should be granted by the Army before granting the easement. Trump's reversal violated treaty rights, he said. The tribe has said it plans to argue in court the impact statement process was wrongfully terminated. 0 Response to "Multiple arrests at Dakota Access Pipeline protest site"